I was a little surprised to see how quickly Kindle fixed my problem with the title of my new publication. It was quite quickly, to be honest. All I did was go to my bookshelf, click on the title and change the series title on the next page. It effectively took my title out of circulation for “up to 18 hours”, but within two or three hours of having made the change, I logged back in and looked at the book and saw the series title had changed on Amazon and my book was back in circulation. This leads me to talk a little more about how easy it was to publish my book on Kindle Direct. I won’t say it was as easy as I had thought it would be. I hadn’t realized all the questions I would be asked and, not knowing how to answer some of those questions sent me on long web-surfing expeditions to find the answers. I would like to give special thanks to another author, whose blog I have been following for about a year now, George Angus. He helped me with one of those tough questions by replying quickly to an email I sent him. The questions, although it was tough for me to know how to answer them because I had never done anything like this before, were not purposely difficult. Nor were they posed in a way that was not easy to figure out their intention. 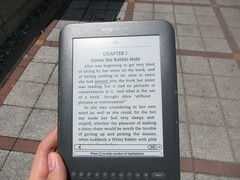 Kindle Direct, I believe, has done well in designing their website to be user-friendly and as easy as possible. After having published through that website, I know I could do it again with little or no problems. The difficulty, for me, was the same problem I have had with some of the “purchase online” websites I’ve used. Simply knowing what was the proper format for each field and which ones to fill out for my needs. The one other problem I had, was learning how to format my book properly so that it would look nice on the Kindle. Not having a Kindle myself, I had to download the Kindle Previewer and then that didn’t want to work for me. The simple online previewer in black and white worked better for me. The KindleGen file converter was hard to find a link to for downloading. What’s more, the ReadMe file that came with it, which is the same one there’s a link to on the Amazon website, was not very well explained and I couldn’t get it to work. All I know about that experience is that anything I have to open a C: prompt and enter commands in order to use is probably not for me. The KindleGen app, (if you can call it that), seems a useless peripheral. That’s okay though. The short story was already written in Word and was easily uploaded in .doc format. I just had to preview it about a dozen times to make sure the cover, the copyright page, the dedications page, and the first page of each chapter, (in this case it was a short story with only one chapter), all showed up where they were supposed to and without having to click through a bunch of blank space to get to them. I’ll post more on formatting in a future post. I also need to say that, were it not for Kindle Direct making things so easy, I would still be sitting at my desk, surfing the web, looking for a company or a website that would take an interest in my book even though I was an unpublished author. I’m very glad this option was available to me. Hey, Roger. Congrats on publishing your first book on KDP. I think you are asking how to promote your book. There are tons of articles and books written on promotion–most all of them suggest a blog (which you have started now), author website (lots of free ones like webs.com and weebly.com plus you can make wordpress into an author site by developing static pages e.g.your book blurb, an excerpt, and buy links), facebook, twitter, guest on other author’s blogs, comment on a lot of blogs and leave your blog addy in the comment, and the easiest of all is including your blog, website, buy link for your book in your email signature. Somewhere on this blog you should have your book cover and buy link. When you talk about your book always mention the name of it. Did you put your book on smashwords? There are a lot of people who do not have kindles so can’t get your story. Smashwords is very similar to KDP but they put your book in all the e-book formats. I haven’t tried it yet. I know covers are very important. You are smart to develop professional looking ones. Best wishes on a successful career in writing and publishing! You’ve mentioned a few methods I have already begun to implement, a few I haven’t quite got the knack for yet, and a few I haven’t heard and/or haven’t yet tried. All said, it’s a good list and I’ll have to organize it for myself and make sure I’m doing it all and doing it well. I wasn’t sure about including a link for my book in comments I make on other people’s blogs because I was worried they may not appreciate that. I’ll try it out and see what happens. You mentioned Smashwords. That sounds like another self-publishing websight for e-books. I’m not sure, but I think the KDP Select program, which my story is enrolled in, forbids me distributing my story through another website. I’ll look into that one too. Thanks for the visit and the encouragement. Feel free to drop by anytime, and let me know if you ever want to write a guest post here. Likewise on the “Best wishes”.